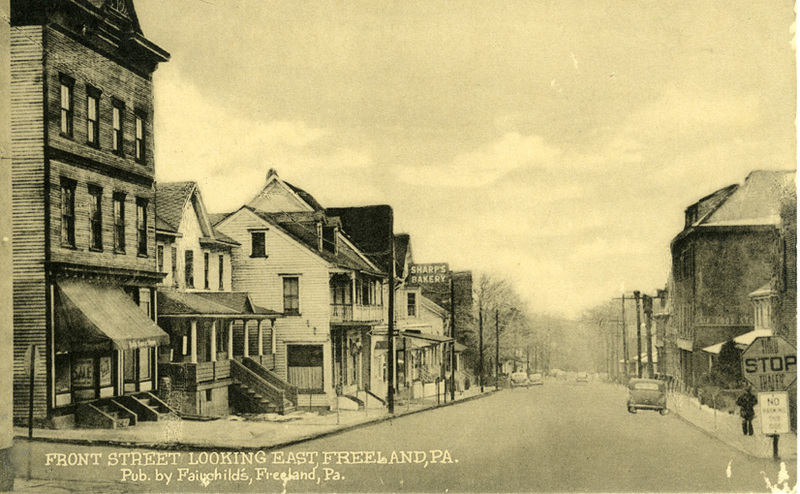 There were quite a few postcards produced back in the day that showed street views of Freeland. Some of them are reproduced here. If you have any others, I would be interested in purchasing copies of them. 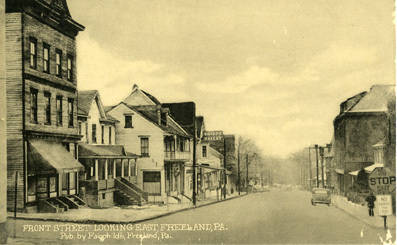 The view at the top of this page shows Centre Street looking north from South Street, before Nocchi's and other buildings were torn down to make way for new construction. A few of the older views were provided courtesy of J. Zubach. 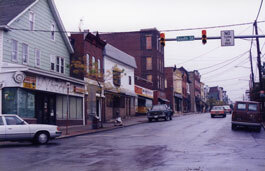 Centre and Walnut Streets, looking north. On the right is the Borough Building. On the left, the building with the wood siding on the corner, is Lloyd's millinery store, where ladies could purchase hats. 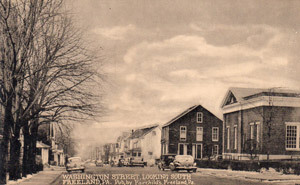 This is a great view of the Borough Building before the steeple was removed. I've got to check my notes to see what that porch is in the left foreground. If you know, I'd love to hear about it. 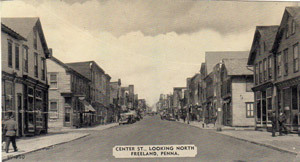 Centre and Front Streets, looking north. 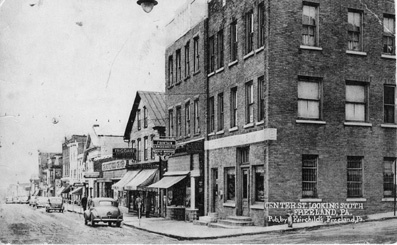 On the right you see William A. Bachman's optometrist office; he also dealt in watches and clocks at the same location. On the left, on the corner, is Amandus Oswald's general store. 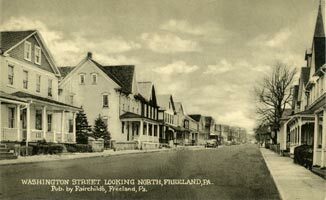 Two other signs are legible on the west side of the street: "Home-made Candies - Fairchild's - Ice Cream" and "Light Heat Power". Many of these buildings are still standing and still identifiable. 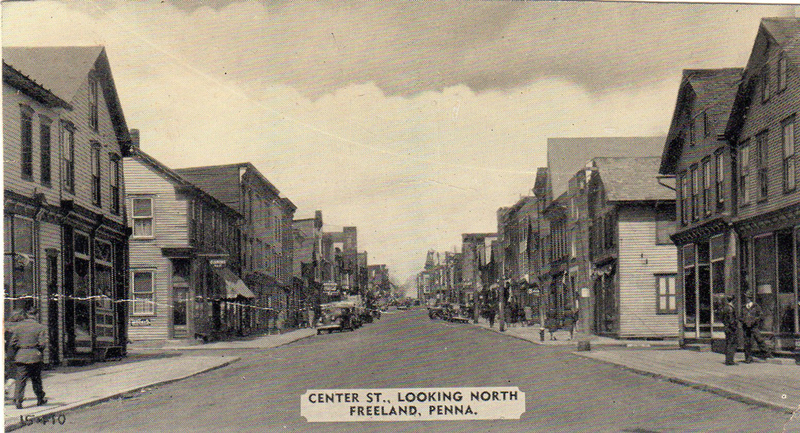 Centre and Main Streets, looking north. That's the Birkbeck Block in the left foreground -- a large building which housed William Birkbeck's hardware and plumbing business, and later a succession of other businesses. Several early models of automobiles are on the street, and it's a little hard to see but it's possible that there's a horse-drawn carriage parked on the left behind the car that's in the foreground. Looking south from just above Centre and Front Streets. At the left of the picture, in the foreground, is the print shop where the Semi-Weekly Progress newspaper was printed. Across the street you can see Amandus Oswald's general store on the corner, with its.covered entryway. There are several trees visible on the next block, including the one or two in front of the Central Hotel. Centre and Front Streets, looking southeast. 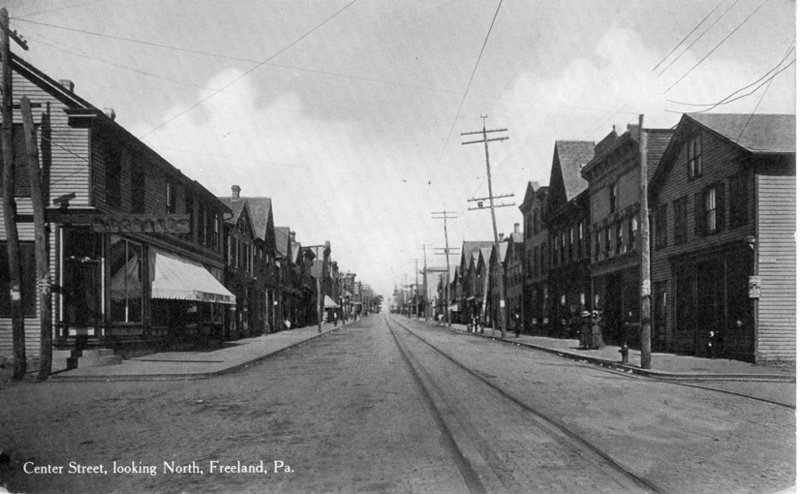 On the right, the First National Bank stands on the corner. I'm not sure, but I think that the tree on the right is in front of the Central Hotel, which is set back slightly and not visible in this view. Compare this view to the next one, which shows the Central Hotel and the Citizens Bank. Again, a number of these buildings are still there and still recognizable. Notice the trolley tracks. 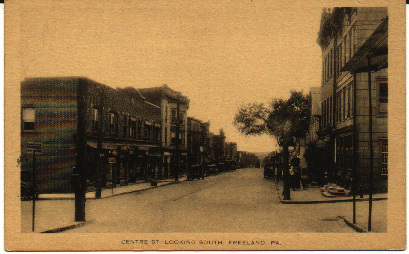 Centre Street, looking southwest toward the Central Hotel and the Citizens Bank. Next to the Central Hotel might be Steven B. Dvorshak's grocery and meat market (it's a little hard to read the sign, but the location is about right). Again, recognizable biuldings and trolley tracks. The Central Hotel also contained a livery stable and a number of other businesses that rented office or shop space from the proprietor, M. H. Hunsicker. Another view looking southeast at Centre Street from Front Street. On the right, the First National Bank stands on the corner. No more Central Hotel, no more trees, no trolley tracks, and look at the cars and buses! Also notice the unusual street light on the left side of the picture, hanging out over the street. Compare this view to the one above of Centre and Front Streets, looking southeast. Similar perspective, but a very different time period. And yet another view looking southeast at Centre Street from Front Street. Look at how similar this view is to the one just above! Fewer cars are on the street, but the buildings are nearly identical. Genetti's grocery has replaced the Central Hotel of earlier views, and the tree is gone. This is another in the Fairchild's postcard series. Centre and Main Streets, looking north. On the left, on the corner, is the Birkbeck block. The tree halfway up the block marks the location of the Central Hotel. In the far distance at the top right you can see that steeple on the Municipal Building. Many of the buildings visible in this picture are still standing and still identifiable. Centre Street, looking north from South Street. This is a great picture, especially in light of the recent new contruction on this site. In thie photo, on the left in the foreground is the Valley Hotel (with a balcony), and next to it a drug store. On the right in the foreground, real estate and insurance offices. On the right, all the way in the background, you can see what looks like a church steeple. 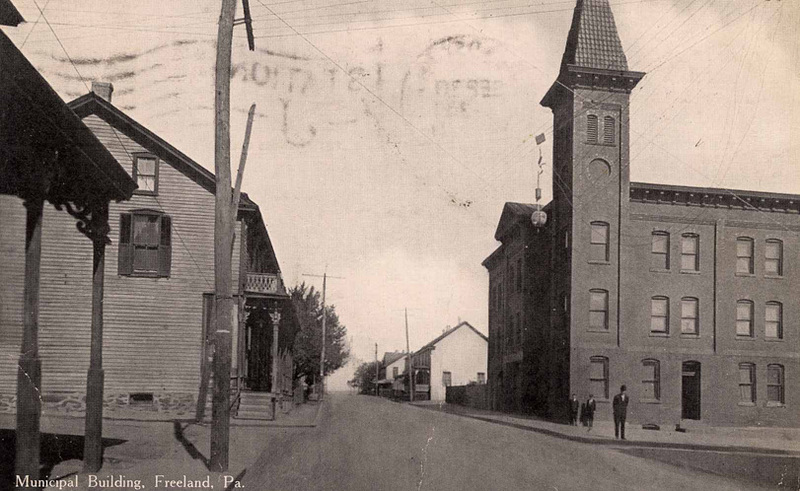 It's the borough building, which at this time still had a steeple. See the photo on my "Municipal Matters" page. 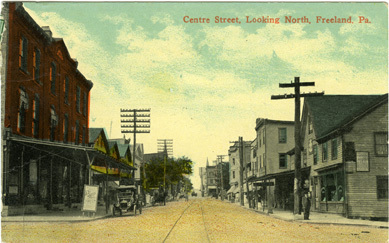 Centre Street, looking north from Luzerne Street. 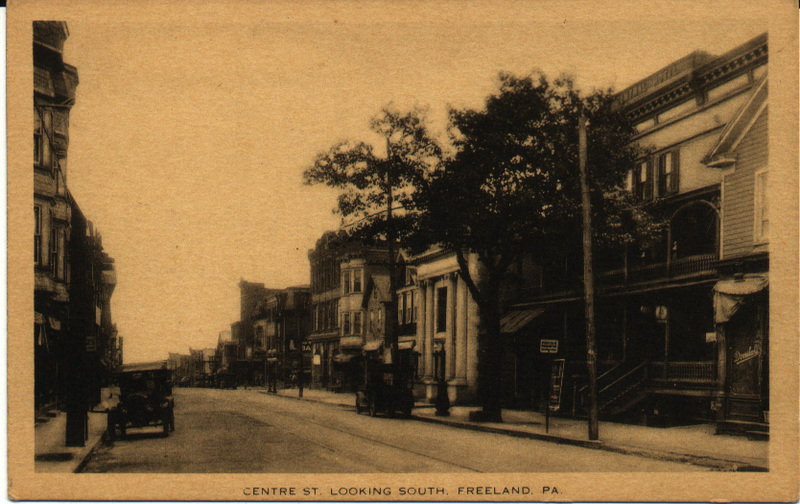 Postcard from Ed Merrick, photo taken around 1935-1936 (thank you to Mark Steward and Joni Nowak Moses for dates). This is later than the one just below, as in this one the trolley tracks have been removed. At front right we see 355 Centre, which was Kasarda's saloon in the early 20th century and later the site of Merrick's grocery store 1950-mid-1960s. Centre Street, looking north from Luzerne Street. Telephone poles were sort of rough and ready, not as smoothly mass produced as they are today. 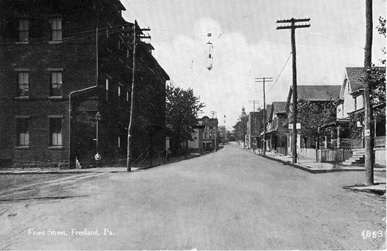 Note the trolley tracks going up Centre Street. No trees until you get up to the Central Hotel on the left between Main and Front Streets, barely visible here. Centre Street, looking north from Carbon Street. There's the Machella and Resuto bar in the left foreground, a familiar site to me because it was across the street from our apartment when I was a kid living above my grandfather's auto supply store. This is another postcard in the Fairchild's series. Washington Street, looking south from just above Main Street. Postcard from Ed Merrick, photo taken late 1940s (thank you to Ed, Mark Steward and Joni Nowak Moses for dates). 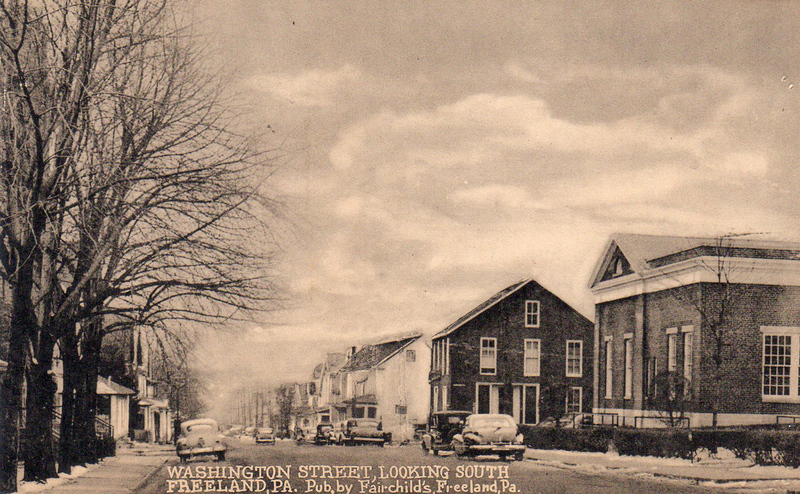 Ed commented: "I remember those mature trees to the left of St. Luke's because of the time I spent at my grandparents' across the street and also because the Warners and the Anthonys lived in the double houses behind them. I went to MMI with Charles Chuck Warner and got to be friends with Ken Anthony, who was a gifted artist." He also noted that it appears that it was snowing lightly when the photo was taken. 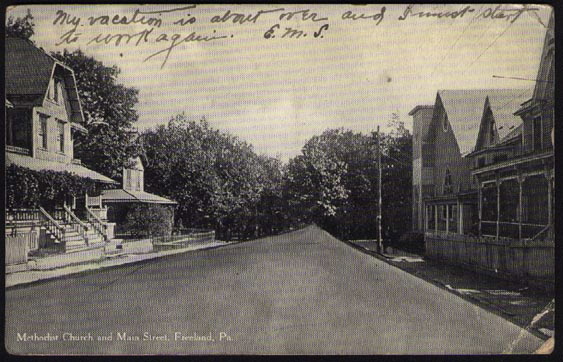 Washington Street, looking north from just above Carbon Street, from Ed Merrick. He writes: "You observed that the utility poles had been removed from the photo. It shows the DiSpirito residence on the left. Farther up the street, a car is parked in front of 342 Washington Street, and the car looks like our 1941 Buick. I am interested in seeing the photo again to determine if there is any evidence of the chestnut trees in the churchyard on the right." After looking at the photo again, he added: "I would bet that they are the old chestnut trees. Our house, at 342 with the car in front of it, is the one with dark siding. 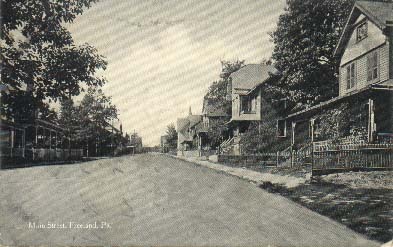 The next houses down, the three-story houses with white siding where the Hill, McElwee, and Sosnowski families lived, are directly across the street from them, and note how much taller the trees are." 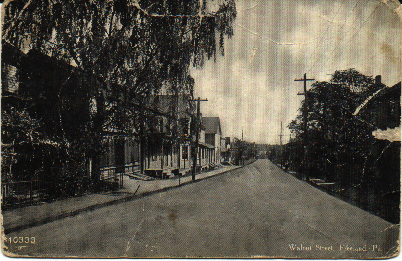 This view shows Walnut Street, looking west toward Centre Street from a block or two east of it (from Washington or Pine Streets?). The building at right in the foreground looks like a storefront, but I only have this low resolution digital photo and so I can't see enough detail to be able to tell. You can see the steeple of the borough building in the back right area of the photo. 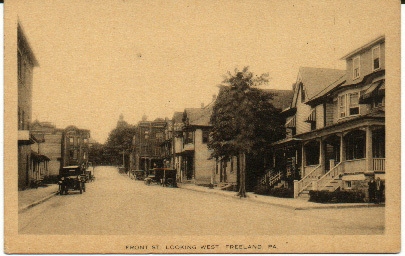 Front Street, looking west toward Centre Street. 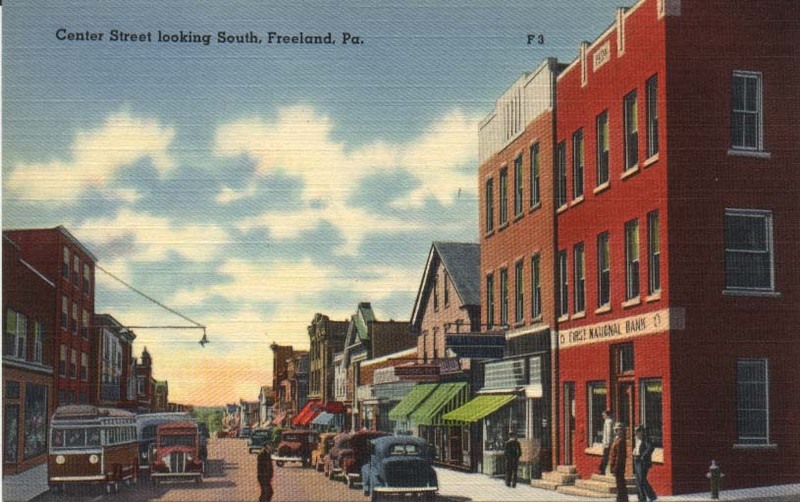 I'm assuming that the large building at left foreground is Krell's Hall, earlier the site of one of our opera houses, and later the site of the A&P grocery store that burned down in the 1970s. You can see the steeples of St. Mary's Church in the back right area of the photo. 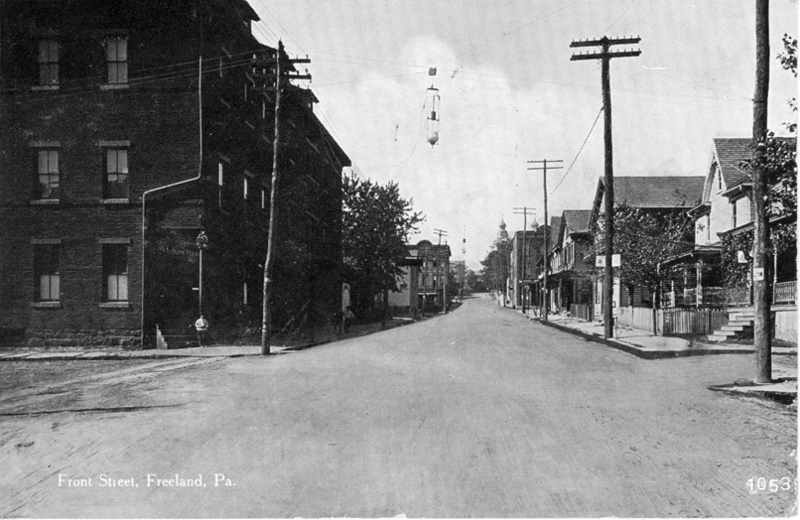 Here we're looking east on Walnut Street toward Birkbeck Street, which you can see at the end of the street. The buildings on this street are mostly homes, as is the case today. There were some nice, large trees along this street. The second building from the left edge of the picture looks like a storefront of some kind, and has wooden doors in the sidewalk in front that would lead to the basement. 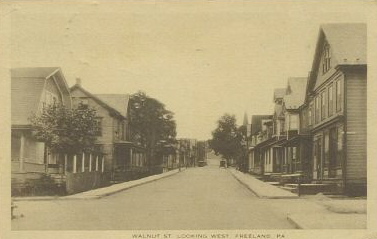 Walnut Street at Washington, looking west toward Centre Street. You can see the steeple of the Borough Building and the uphill rise of Walnut Street west of Centre. That's Henry George's grocery store in the right foreground, shaded by a large striped awning to protect people and produce from the heat of the sun. I wonder how long that tree lasted before it was taken down? 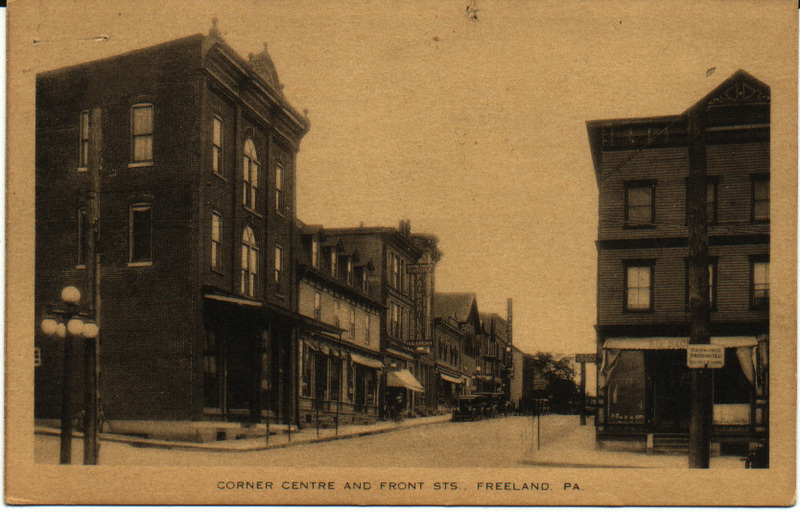 This is a great image, looking toward the intersection of Centre and Front Streets from about a half block east of the intersection, on Front Street. On the right you can see the sign for Sharp's Bakery. At the intersection across Centre Street you can see De Pierro's on the left (where the bank is now) and Oswald's general store on the right. The twin steeples of St. Mary's Church are visible in the background on the right. There were some nice-sized trees along the street, too. 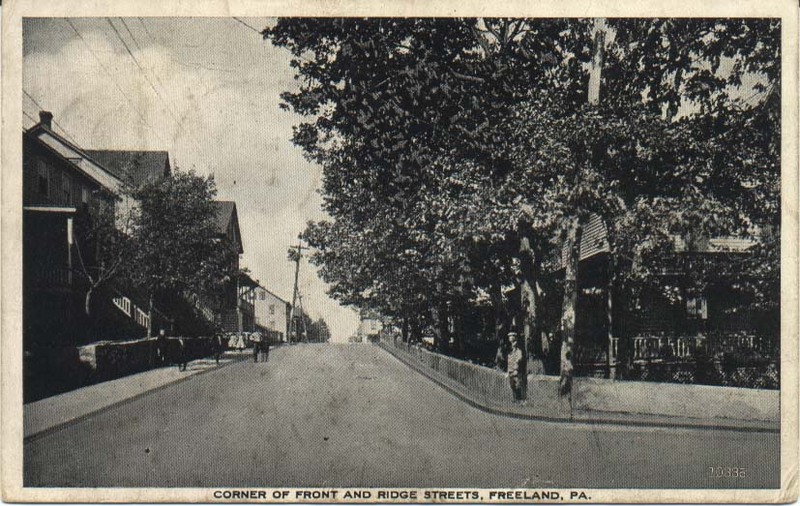 Here's another Front Street view from a couple of decades later, standing at the intersection of Front and Centre Streets and looking east toward the Public Park instead of west toward Ridge Street. There are several recognizable buildings in this photo. This is from a wonderful series of postcards produced by Fairchild's. This postcard shows the view from the intersection of Front and Ridge Streets, looking north toward Walnut Street. 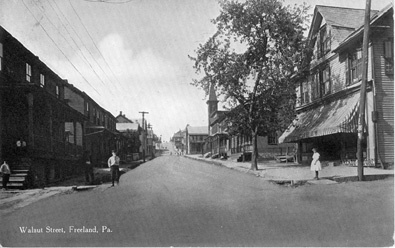 This was a quiet residential area at the time of the photo, even more so than it is today, and although you can't see it here, the Bethel Baptist Church is at the end of the block ahead on the right. This shows some beautiful homes with fenced lawns and yards, and quite a few trees along the street. The church steeple visible at right in the background is the original St. Luke's Lutheran Church, a wooden building that was later replaced by stone construction. I can't tell what's at the far end of the street -- trees? The Public Park is behind the person who photographed this view. Here's another view from about a block up the street and facing the other direction, toward the park. 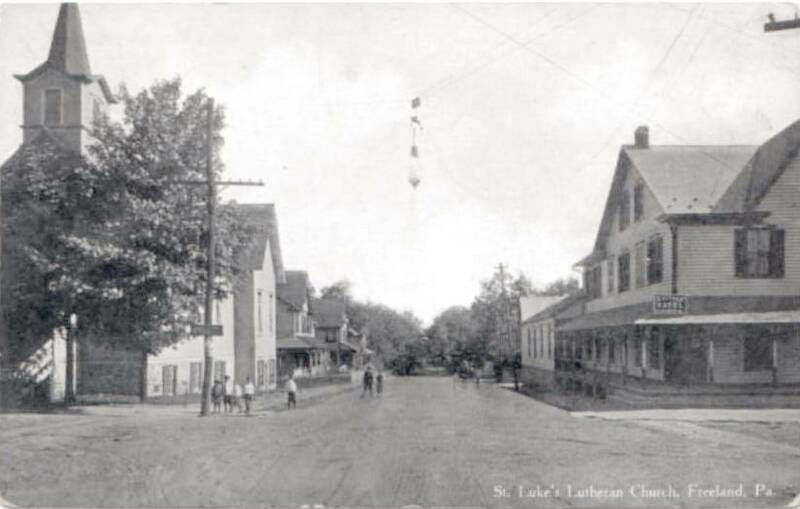 The original St. Luke's is on the left, and the Cottage Hotel is on the right. This is another one that I only have this one low-resolution digital image of, and so I can't provide better detail at present. Still, it's enough to give you a sense of what that neighborhood looked like. This is kind of an odd view. 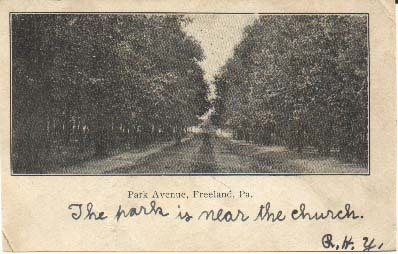 It shows an unpaved roadway through the park, looking westward toward the east end of Main Street, where the Park M. E. Church is. The caption of this postcard says, "Park Avenue, Freeland, Pa." You can see that at this time the park was still rather densely wooded. In this view, the photographer was standing about a half block west of the Park M. E. Church, facing east toward the Public Park. You can see the church, the last building on the right. 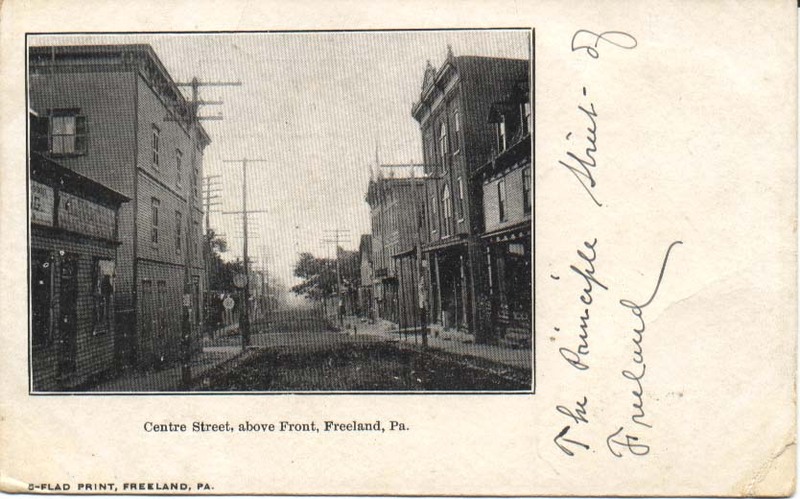 The postmark on this postcard is dated 1912, so while we don't know what year this photo was taken, we at least know that it's no later than 1912. I have a clipping from what I assume is one of the Hazleton newspapers. The name of the paper isn't on the clipping; the article has the heading, "News of the North Side", and someone has written in ink, "4-26-26". 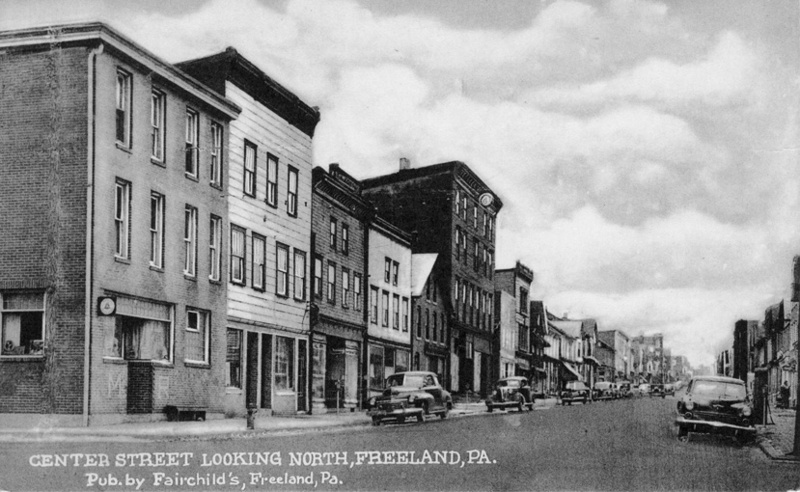 The article names 6 Freeland streets and says who each is named for. The text is reproduced below, and as I get access to biographical notes about these people, I'll add links to that information. 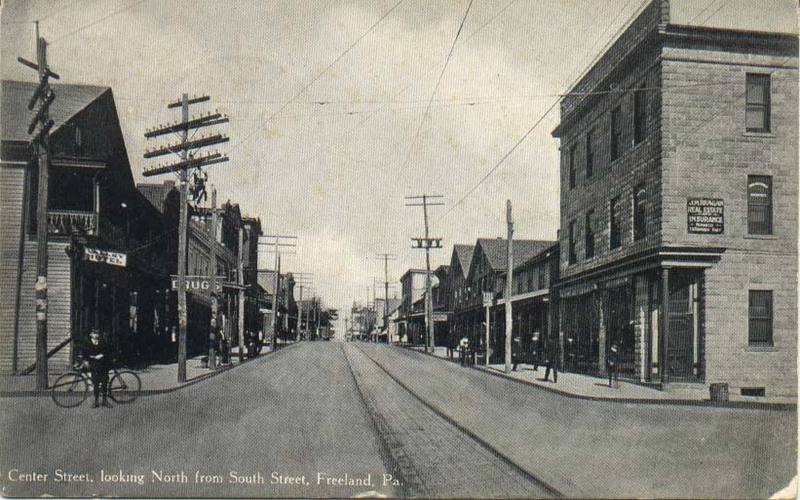 That the people of Freeland have the faculty of apreciating worth and public services is seen in the names of many local streets. Birkbeck street has been so named as a public recognition of Joseph Birkbeck and brother Thomas, who did much to build up the town. Schwabe street is a memorial to the life and labors of the late Mathias Schwabe. Johnson street has been so named as a tribute to William Johnson, also deceased, who was one of the town's pioneer residents. Alvin street and that section of the town known as "Alvington" has been so named as a tribute to Alvin Markle, who is still much alive and a prominent Hazleton banker and traction magnate. Burton street has been so named to commenorate the life and labors of John Burton, now deceased. Meehan street in Foster Township is so named as a tribute to contractor Patrick Meehan, now retired, but very much alive, a man who built more foundaton walls in Freeland than any other contractor. Cunnius street is surely named for John M. Cunnius, proprietor of the Freeland Planing mill.